Warning: The following contains spoilers for Hulu’s Castle Rock. Read at your own risk! Throughout this season of Castle Rock, Sissy Spacek’s Ruth Deaver, who suffers from dementia, has struggled to keep up with the world around her. But the latest episode of the Stephen King-inspired drama, “The Queen,” chronicles a day in her life (and her mind), and as it turns out, Ruth isn’t some helpless woman with a disease. She’s more like a time-traveler — or a “time-walker,” if you prefer Wendell’s (Chosen Jacobs) videogame term. Her days are fueled by memories, and though those flashes to the past can confuse her, she tethers herself to the present using chessmen gifted to her by Alan (Scott Glenn) years ago. Below, Shaw breaks down Ruth’s journey and that devastating ending, what it was like crafting an episode that blends the past and the present, and why those chessmen made the perfect touchstones. ENTERTAINMENT WEEKLY: Why did you want to tell Ruth’s story and delve into her mind so deeply? SAM SHAW: For personal reasons, I was thinking a lot about dementia, and I was reckoning with it outside of work. I knew that this episode was going to be an important part of the season, so it was looming on the horizon for a long time, and it was a profound experience to write it. It felt like an opportunity to tell a slightly different kind of horror story by trying to reproduce for the audience some of the sense of dislocation and deprivations of dementia, and to do it in a visceral way. This is such a showcase for Sissy. What were your conversations about it like? Sissy’s incredible. We spent a lot of time in the early going just talking about how we were going to represent her dementia on screen. There’s a documentary that Sissy loves that I’d never seen before called Complaints of a Dutiful Daughter that’s a slightly different look at dementia, and part of what’s fascinating about it is that it’s funny at times. There’s a lightness. We tend to think of stories about Alzheimer’s as these dirges. Having seen it up close, there’s no question there’s something profoundly tragic about the disease, but there are also people who find lightness and humor in dementia, and so we spent a lot of time just talking about what dementia would look like in this story.… I was nervous when I sent [my script] to her because I wasn’t entirely sure how she would take it, but it was really exciting that she connected with the episode really quickly. This episode also had the tricky challenge of showing what Ruth’s going through. How did you work with director Greg Yaitanes on choreographing memory and time blending together on screen? The craftsmanship of this episode was breathtaking to me on almost every level, at every department. But in particular, it fell to Sissy and to Greg to take an episode that could have been really cerebral and complicated and make it emotional and simple. And the truth is, there were like a thousand really wonky and minute decisions that had to be made at the writing level, and then at the production level. For me at the writing level, I knew I wanted Sissy to play herself in all of the time periods. I didn’t want to cast younger Sissy, I didn’t want to de-age her or to use VFX or makeup.… But then there are a whole bunch of other questions you bump into, like, if she walks out of one room in 2018 into a memory in 1991, does her wardrobe change? Does her hair change? Her makeup? All of these are important questions, obviously for the wardrobe department, and for Greg as a director and also for Sissy in inhabiting the part. So on a production level, how did it work? How did you guys figure it out? It was interesting to me to think about the idea that people with dementia fall into their own time loops. They return to the same memories, and if you spend time with them, you can feel like you’re on your own merry-go-round. I loved the idea of putting the audience into that same headspace, where they’re forced to return to moments they’ve seen before, maybe extracting some new piece of information from the moment — or maybe not. Structurally, there are these moments throughout the episode that I almost thought of as islands. You paddle through choppyc waters and you arrive at terra firma, touchstones that help you orient. In a way, those are chess pieces for the viewer. Speaking of which, why did you choose those chessmen to serve as her touchstones? 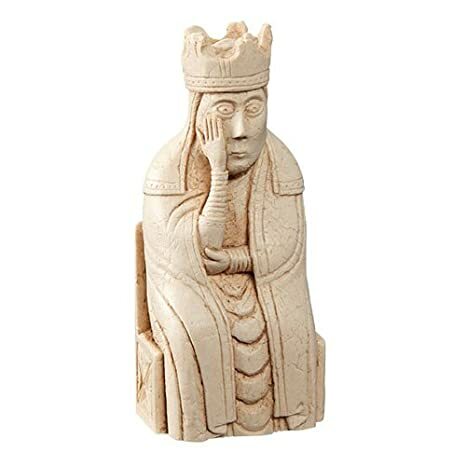 They’re called the Lewis chessmen, and they’re a reproduction of the famous chess set discovered in a Scottish coffin. I became really fixated on them in part because Sissy’s character, although it doesn’t ever get explicitly stated, was a teacher and studied Icelandic literature and sagas, so it felt like an apropos gift for her. One thing I hadn’t known about the development of chess is that originally the queen was the weakest chess piece on the chessboard. Its movements were really limited, and at some point the queen became the most powerful piece. If you look at the original Lewis chess set, one thing that is really striking is the queen. They have this totally stricken look, and most of them have a hand up against the side of their face in sort of shock or grief or something, and so it feels like almost a physical expression of the horror of being a character who is fundamentally limited. This felt like an episode where we take the character who has been set aside and treated like the most limited character on the chessboard of this season of storytelling and let her, for this one hour, reign. At the end of the episode Ruth notices the chess pieces, so is she deliberately letting herself live in the memory of Alan’s return and refusing to acknowledge her coping mechanism? I should let the piece speak for itself, but an idea that was important to me was that it’s natural to think about dementia as a state of diminishment and deprivation, that life becomes thinner. This episode presents a vision of Ruth’s life that’s actually very full. She lives in this memory palace and she’s surrounded by the events of her own past — sometimes for better, sometimes for worse — and there’s this thought that dementia taketh away, but it also giveth in the sense that if there’s a gift for Ruth at the end of this episode, it’s that even though she’s lost this person who’s enormously important to her, she can still choose to live in that memory of him returning to her. Right. So that choice for her, which I think Sissy plays really beautifully, felt like the place to end this episode. I wouldn’t quite call it a happy ending, but she gets something at least in compensation for everything she’s lost. Now, how did you convince Stephen King to let you kill off Alan Pangborn? [Laughs] Well, we approached that choice with a real sense of humility, and we were prepared for Steve to nix the idea, so we went with our hats in our hands. It was really gratifying that he gave us the permission to tell the story we wanted to tell, and I hope it feels like an honorable and fitting end to the character. It felt like we were telling a love story about Alan Pangborn this season, and so it felt like we were ending his story with something more fitting than it would have been if he had gone out in a blaze of glory fighting some demonic force of darkness. But was Ruth right about the Kid, then, that he was in some way channeling Matthew Deaver? Part of the tightrope of this episode is it may be a story about a woman who, although her consciousness has diminished, has a clearer-eyed view of the Kid than anyone in our story, or it may be a story about someone with Alzheimer’s who is depressed and anxious and hatches a kind of very far-fetched idea about the provenance of Bill Skarsgård’s character. You just have to hang tight to find out, but I’ll say this: Everything that happens in the front story of this episode actually happens. We’re not gonna play fast and loose with the audience in terms of what Bill’s character says on screen, and the actions he performs. Lastly, the title of the episode is “The Queen.” I know that’s referring to the chess piece, but is it also a reference to Sissy’s role in Carrie and her eventual status as prom queen? [Laughs] There’s a little bit of the shoutout to prom and to Carrie in the title, for sure. Castle Rock adds a new episode every Wednesday on Hulu.